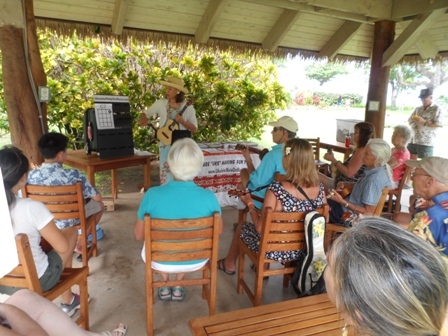 This was my third year of giving ‘ukulele workshops at the festival, and the second under the leadership of Alan Akaka of Ke Kula Mele Hawaiian School of Hawaiian Music (from Oahu). New this year, I gave three rather than two workshops on Saturday, and The Hawaiian Serenaders did not perform on stage at the Sunday Brunch. Thus, we did not stay overnight at the hotel (as in previous years) and left the festival right after my last workshop. 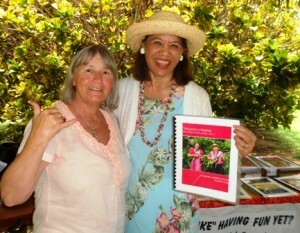 As it turned out, being outside all day in the voggy air wore us out, so it was good to go home to cool upcountry Maui. When the volcanoes on the Big Island erupt and the wind blows from the south, we call the conditions vog and it is sometimes difficult to breathe. 1st Workshop: 9-10:15 a.m. Five people registered, but 15 total signed in. 2nd Workshop: 11:30 a.m. – 12:45 p.m. Four people registered, but 15 total signed in. 3rd Workshop: 2-3:00 p.m. Seven people registered, but 13 total signed in. As a result of pre-registering online, there was one person who scheduled a private lesson before and one person who scheduled two private lessons for after the workshops. Some people who walked into the first workshop had so much fun that they came back for the second workshop. Our numbers of participants were definitely higher than what we saw at some other workshops. We’re happy that learning to play the ‘ukulele is so popular. See more photos with captions from my Workshop Photo Gallery. 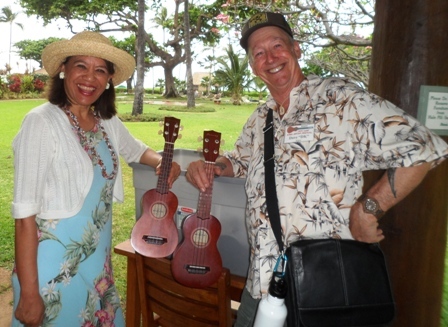 We hope to be invited back to teach ‘ukulele at the 8th festival April 15-17, 2016.